Water-fed Pole Systems are the latest technology in window cleaning and have revolutionised the window cleaning industry. These new pole systems have rendered ladders obsolete. Using a window cleaning pole system is a more efficient, more effective and safer. They only use water to achieve these great results, pure water. Because the water is pure, it leaves no marks when it dries. The system uses a soft bristle brush to remove dirt and smears from the glass. Then the pure water can be left to dry, leaving clear windows with no water stains. How does the system save you money? Just like in any industry prices are inflated due to risk, the greater the risk the higher the price. Hiring lifts, scaffolding or cherry pickers can be very expensive. Using traditional window cleaning techniques takes longer, inflating prices. But you save money with the pole system because there’s no risk, no high access equipment required and it take less time. We can pass on these savings to our clients, saving you money. 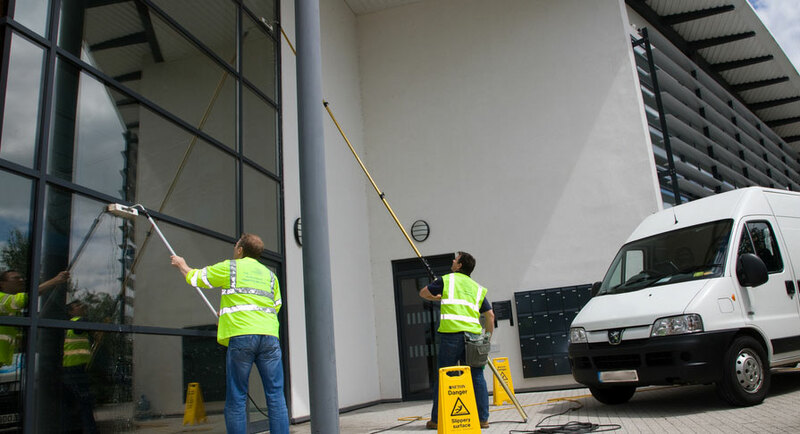 If you’d be interested in our window cleaning services contact us today!